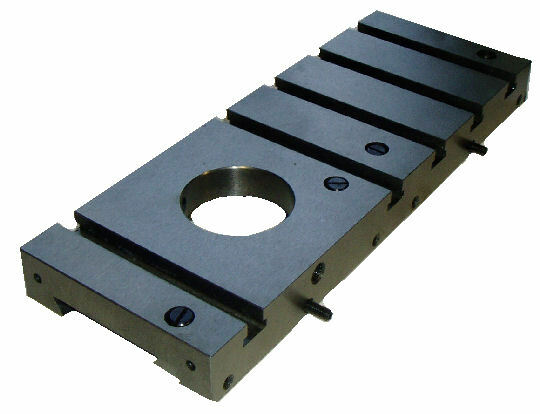 Cross slide for Super 7 lathes. First, assemble the feedscrew in the bracket, and slide your new cross slide in place (on to the dovetail). Screw the feedscrew into the feednut, so that the bracket is now pushed up against the cross slide. Next, use some toolmakers clamps to align the bracket, and make sure that it is at the correct height. Spot through the holes of the bracket for drilling. Next, using a stand drill, drill the holes into the cross slide (the holes should go in roughly 3/4"). These were originally tapped 2BA, but M5 will do just as well if this is easier to come by.